When incorporated into athletic training programs, the Original Strength system has bolstered the careers of professional coaches and trainers, as well as enhanced the physical abilities of athletes around the world. 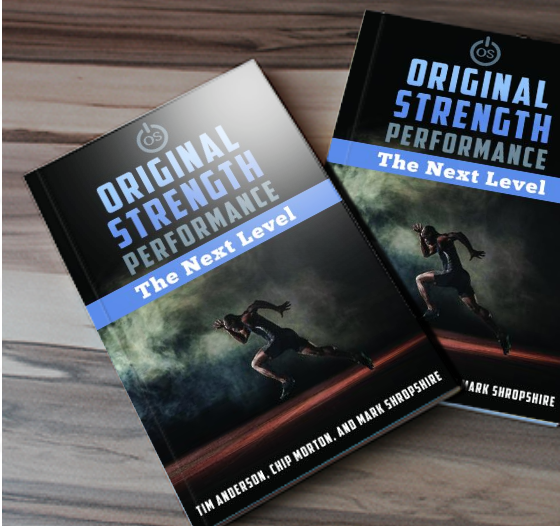 OS Performance – The Next Level goes even further by providing the knowledge needed to optimize the physical and mental performance of athletes on and off the field. Learn how to elevate your team and staff to new heights. Optimize the individual athletic performance of your athletes through challenging the design of their bodies safely, efficiently and effectively. This soon to be textbook is perfect for anyone truly growing their athletes. Take your athletes to the next level by helping them use their bodies the way they were designed to be used. Chapter 1: What is Performance? OSP- The Next Level is a tool kit. The gang at Original Strength have given us a blue print to take the principles of the OS system and enhance it to train us to the next level. That’s right I said “US”. Using this method we are all ATHLETES and we should all be able to move well and stay strong for life. This book is the template for doing just that! If you ever wanted to know how to enhance any performance level activity this book shows you how! The chart for the movements with the resets and progressions alone is SOLID GOLD! A must have if you are a Coach/Trainer or even just someone who wants to learn how to get really strong without the confusion!